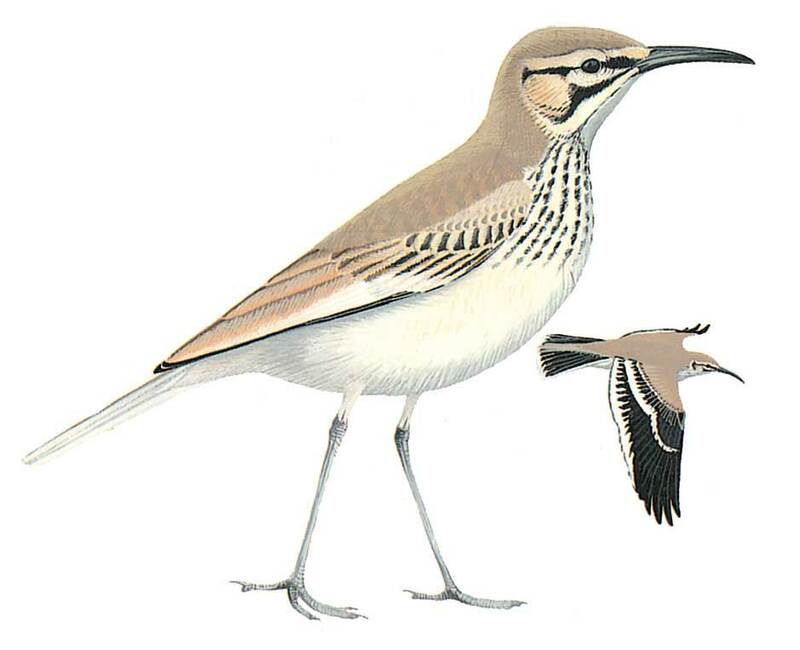 Large, slender lark, easily identified by its long decurved bill, rather long pale legs, long tail and, in flight, bold black and white bands through wings. Upperparts unstreaked sandy grey-buff, underparts whitish, often spotted black on breast; whitish supercilium, dark eye and malar-stripe. Juvenile spotted on mantle but almost without breast-spots; bill less decurved. Speedy runs with sudden stops in upright position. In characteristic song-flight male ascends vertically, up to about 4 m, twists over and spirals to bush or ground with outstretched wings. Solitary or in pairs, not mixing with other larks.